So my two friends Audrey and Katie and I have been talking about doing an at-home spa night for awhile now. Our lives are so hectic between the pool, shopping, going out for Starbux, etc! So this week for our Bible Study meeting, we chose to do a spa night at my house. Audrey brought an amazing Spinach dip, Katie brought luscious fruit and a caramel dip, and I made Raspberry Bars and Fruit Punch. We started at 6 which we usually do, and went past 11pm as we usually do... And as if it couldn't get any better? My sister Re was able to partake with us!! I then organized them according to brand, with my current favorites outside the box: Mattese Elite and Sally Hansen Crackle. 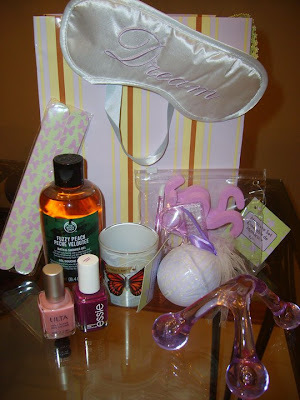 And of course, GIFT BAGS for the girls!! The next morning at the pool we got to discussing doing this as a ministry for women. New moms, stressed moms, women who are stressed, or just women wanting to fellowship together. It was a simple set-up and oh-so-relaxing! I HIGHLY recommend an at-home spa night! I found recipes and tips for an at-home spa night here online, with the majority of the ingredients already on hand. I still have the Rose Stringent in my refrigerator, hoping to try it tonight! With a few rearrangements, litte out0of-pocket, and a little planning, we were able to have an awesome, relaxing spa night!